This past Saturday, Milpa Kitchen & Cantina’s very own Jonathon Cerda prepared a host of cocktails designed for the fall; in his own words, a “true display of Mexican craft spirits and fresh ingredients”. We couldn’t miss such an opportunity to display the latest in local craft cocktail artisanry, which melds time-honored American cocktails with classic Mexican flavors, and trust - this lineup does not disappoint. Paraíso Perdido - Tres Generaciones Añejo, coffee infused tequila, half-n-half with a hint of lavender, sweetened with homemade flan honey and condensed milk. Served with a Flan. Our first cocktail of the night came paired with a delicious flan, garnished with strawberries and cream; a perfect match for the cream of the dangerously delightful cocktail. The Paraíso Perdido itself is made with flan honey and condensed milk, which provides an easy mooring to the like flavors of the dish, yet also creates a horchata-esque flavor in the cocktail itself. 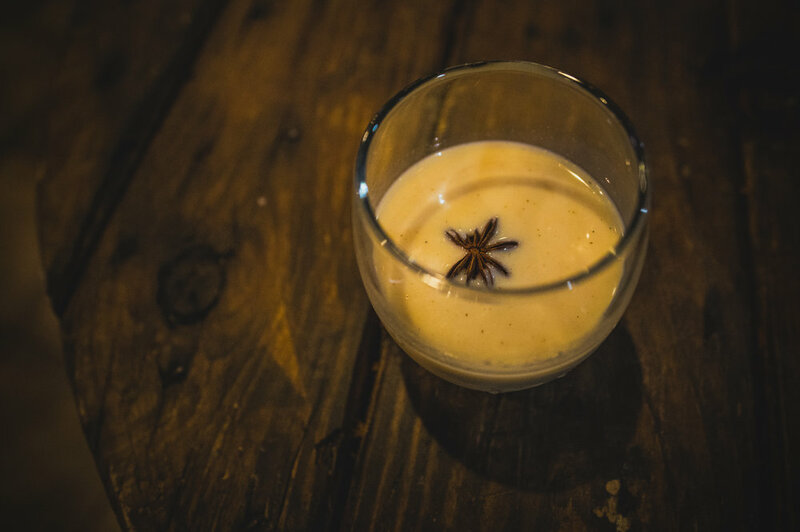 The coffee infused tequila is subtle, on its own, but after a bite of flan, the flavor takes center stage, reminiscent to tiramisu in the cream and coffee vibe it gives. Throw in the gorgeous star anise garnish - whose licorice flavor pairs well with the soft subtlety of the lavender - and you have a delectable intro to the menu. An elegant Mexican twist on a simple classic, this Old Fashioned-style cocktail takes a bold step in using the very corn-forward Sierra Norte whiskey, which immediately evokes the flavors of a homemade tortilla, with every bit of that earthy comfort and familiarity woven into this inspired package. The Maraschino liqueur pays homage to the classic recipe’s garnish of a cherry, while also coating the mouth in a manner similar to simple syrup, providing a silken mouthfeel to balance the spirit-forward nature of the drink. Finally, the candied orange peel completes this new take on an old trick, giving a nice saccharine delight on top of this humble yet inspired offering. This cocktail - somewhat reminiscent of a mojito in terms of the glass, color, and flavors - boasts a unique garnish in the form of a roasted tomatillo, which packs more punch than your average picturesque but ultimately feckless topping. With a kick - in parts almost minty, and in others veritably smoky - from the various peppers, this otherwise light, fruity cocktail gets a nice jumpstart that elevates it beyond any similarly styled drink. The smoke notes from the ancho and roasted tomatillo harmonize perfectly with the undertones imparted into the gin by the mezcal barrels. Overall, a true refreshment in every sense of the word, re-energizing the senses in both presentation and taste. 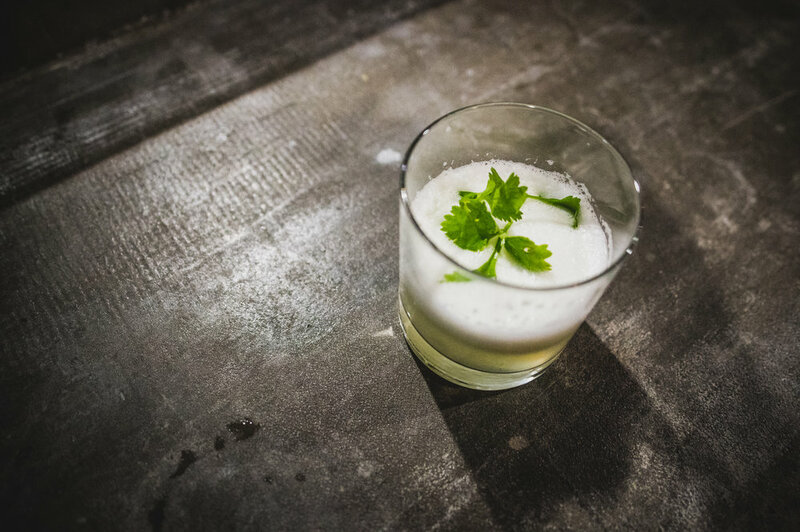 The cilantro garnish immediately entices both the eye and the nose, who then convince the mouth to partake, experiencing a nice orgeat foam that gives away to the bouquet of lime and pineapple - a perfect follow-up number to that original temptation. The tequila here feels so in its element that it hardly registers as being a hard spirit. It is artfully subtle, silken, and simple, going down like a light creamy juice more than a cocktail. This cocktail, so aptly named, wields its flavors with simple authority, needing no flourish nor gimmick to force the palate into gleeful submission. Like the cacophony of a firework finale, the Smoking Mirror comes in hot as the brightest burning star of the show. With a litany of different flavors born from a length rap sheet, the cocktail boasts a smoky front that, once the haze clears, leads into a nice spicy sweetness with saccharine undertones and a nice bit of fruit. The spice leaves a nice savory burn in the back of the throat, but the mouth is refreshed by the zing of spices and the bouquet of fruit flavors. The plumb skin garnish resembles a strip of bacon, which one would not be remiss in thinking, for it encapsulates the sweet and smoky flavors within. 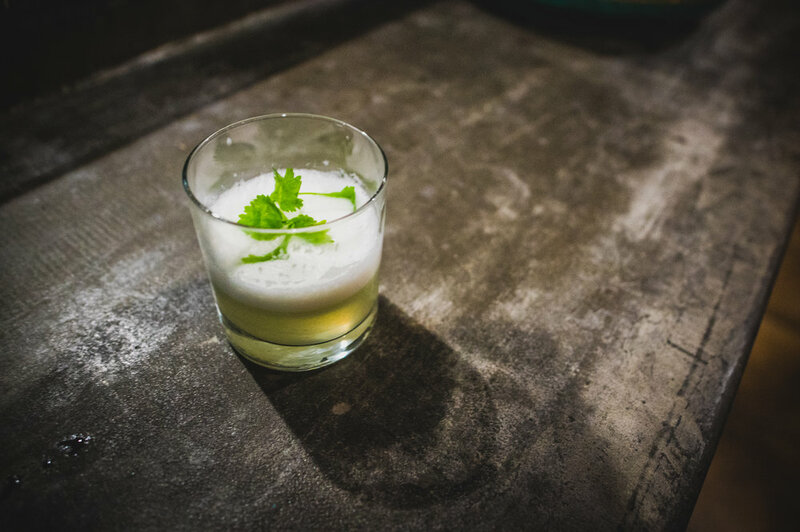 The fruit notes linger on the tongue, while the mezcal and habanero wash backwards down the throat, warming the soul as much as it does the palate. Every cocktail on this bill is worth the trip out on its own; however, this final offering is the standout for its creator, we’re told, for us - and for our humble friend and collaborator, Zach Walker. This evening debuted a wonderful set of additions to the local craft cocktail scene which will not be lost amongst the crowd.